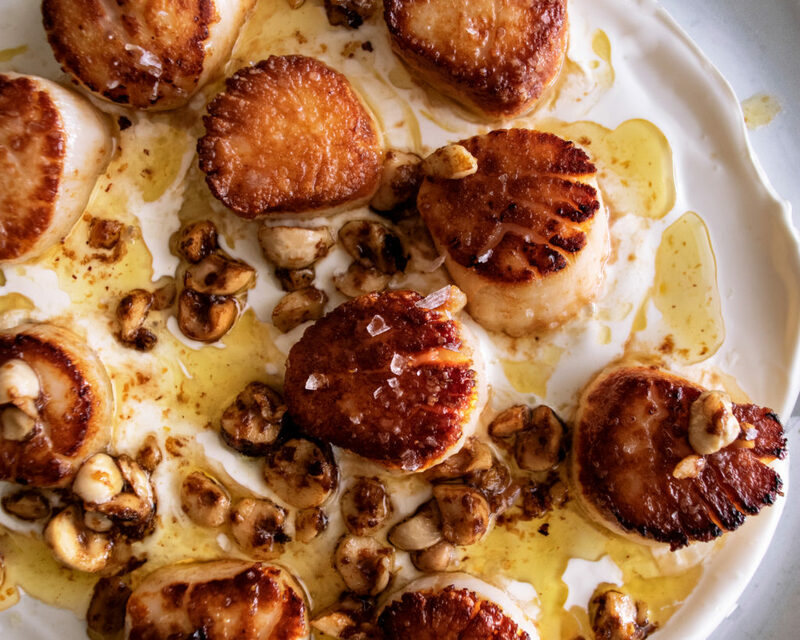 Today’s recipe is the perfect example of why I love cooking seared scallops. 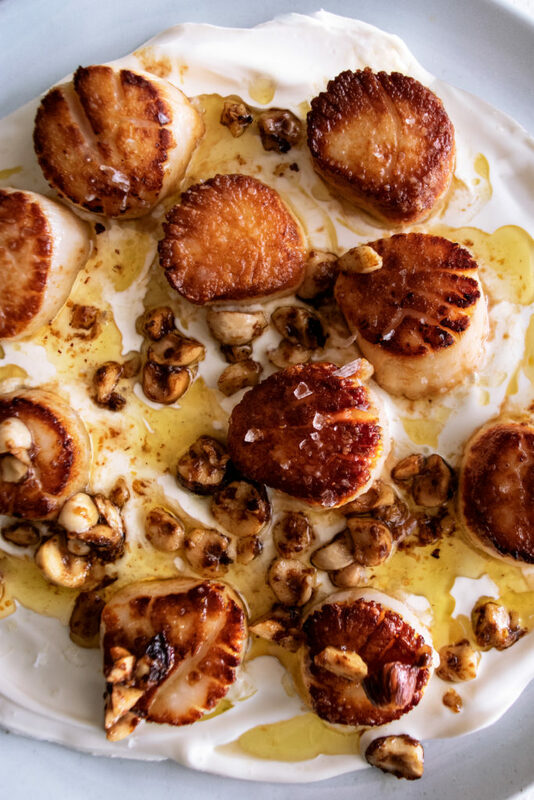 In just a few minutes…you can sear them, sit them on top of mascarpone, top them with lemony hazelnut butter, and feel like a million bucks. This is one of those dishes that is every bit as luxurious as it looks, but contains the simplest of ingredients. And I kind of think that’s the beauty of scallops. They really don’t need much at all to look and taste extremely special. I especially love this combination of creamy mascarpone, a buttery hazelnut “sauce”, and a touch of lemon to cut through all that richness. With each bite you get a little of everything, as the warm butter slowly melts the mascarpone and the scallops soak it all up. I hope you love this! It was a quick little dish I made the other day and wasn’t really even planning on sharing the recipe, but hopefully you love making it as much as I did! 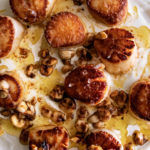 *For all of my tips on cooking scallops, head to this post! Preheat the oven to 425°F. Lay the hazelnuts out onto a baking sheet. Roast for 6 minutes. Let cool just slightly and use a kitchen towel to rub the hazelnuts between your hands in order to remove the skins. Discard the skins. Roughly chop the hazelnuts. Set aside. Meanwhile, pat the scallops dry. Season each with a good pinch of salt on all sides. Heat a large stainless steel skillet over medium heat. Once the pan is hot, add enough oil to just coat the bottom. Once the oil is hot, place the scallops into the pan. You should hear a sizzle. Sear the scallops until deeply golden brown on one side (don’t try and move them until they are fully browned and start to release on their own or else they will stick and tear). Flip the scallops over, turn the heat to low, and add the butter. Finish cooking the scallops as the butter melts, just another minute or so. Spread the mascarpone onto a large plate. Place the seared scallops right on top, leaving the butter in the skillet. Add the chopped hazelnuts to the butter. Let the hazelnuts sizzle in the butter until fragrant, as the butter starts to slightly brown. After a minute or so, stir in the lemon juice and zest. Soon the mixture over the scallops. Top with flaky sea salt.